The south-western English county of Dorset has two very different faces. On the one hand, it makes us think of classic seaside resorts and Victorian dinosaur hunters. On the other, it is more rural in nature, with rolling green hills, thatched cottages aplenty and historic market towns. Dorset's seaside resorts of Bournemouth and Weymouth are as traditional as they come. They are the sort of places where you unfurl your windbreak, pop up the hired deckchair and tuck into a Mr. Whippy ice cream. The area around Weymouth is known for its sailing events and use as a venue during the 2012 Olympic Games. 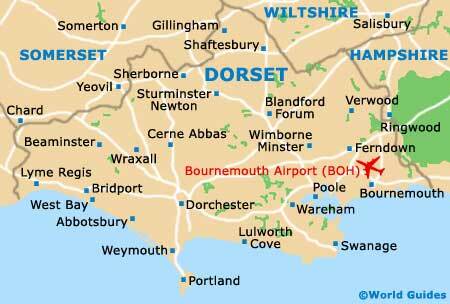 The county of Dorset is also home to the Jurassic coast, which over the years has yielded numerous dinosaur fossils. Head down to the beaches around Lyme Regis today and you can still see people bent over, chipping away at the rocks with tiny hammers in search of a souvenir ammonite or two. Inland are such bustling towns as Dorchester, Blandford Forum and Shaftesbury. Dorset has more than 30 museums scattered throughout its principal county towns. It is also known for its annual festivals and steam fairs. The largest is the Great Dorset Steam Fair, which takes place each August. Also especially popular in the summer is the Bournemouth Air Show, which now attracts over a million visitors each year. Dorset is also Hardy country. Many of the settings used by the 19th-century author Thomas Hardy can be found here, albeit under different names. Dorset still acts as something of a magnet for writers. Douglas Adams wrote 'The Hitchhiker's Guide to the Galaxy' whilst he lived in this county. Ian Fleming, of James Bond fame, also spent his formative school years here. Dorset's busy ports of Poole and Weymouth are the starting points for many a French adventure, with ferries leaving regularly for ports on the other side of the English Channel.